The omnipresent watching aircraft of dystopian science fiction has quietly become science fact. Meet Wide Area Aerial Surveillance, the all-seeing eye in the sky that will change our lives forever. Streaming video, just twenty years ago considered the holy grail of real-time aerial intelligence as seen in the clip from Patriot Games below, has become commonplace over the post 9/11 battlefield. This trend has been spurred by the proliferation of unmanned aircraft, most of which rely on streaming video to operate. Their sensors have also increased in fidelity rapidly, as has the communications technology that supports their operational use. Tactical real-time streaming video probably hit its public crescendo with the SEAL's raid on Bin Laden's Abbottabad compound, where an RQ-170 Sentinel stealth drone provided real-time over-watch and streaming video that made its way all the way to the White House Situation Room. Meanwhile, the ability to provide steaming aerial surveillance has migrated its way to fighter aircraft target pods, P-3 Orion maritime patrol aircraft and other manned platforms. Still, all these systems have a common drawback, the tight field of view that these aircraft and drone's sensors provide which is good for up-close detail work, but bad for situational awareness or for tactically effecting more than what they are zoomed in on at any given time. Over the last decade, the DoD has been working with industry to develop a surveillance payload for aircraft, drones, blimps and airships, that can breakthrough this decades long "soda straw" narrow-field view of the battlefield from on high. Systems such as Gorgan Stare, ARGUS, Vigilant Stare and Constant Hawk are all developmental iterations of the Pentagon's goal to be able to continuously survey a whole village, or even an entire city, via a single 'sensor platform,' or just a handful of systems that are networked together. Additionally, these systems are to allow multiple "customers," or end users, to manipulate and leverage their collected video data in real time. 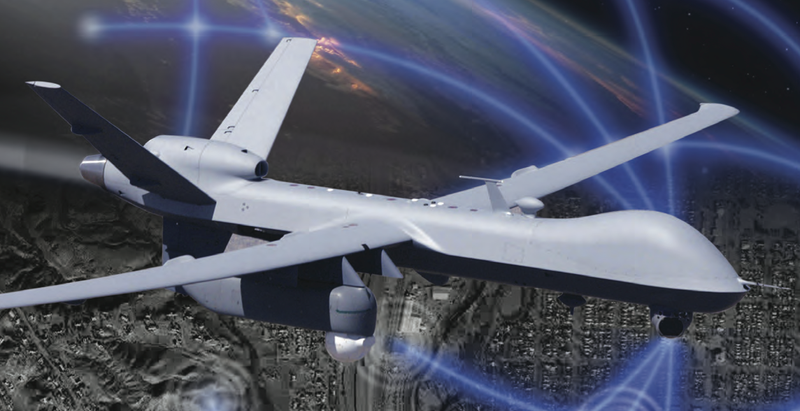 Generally, the Wide Area Aerial Surveillance (WAAS) concept works by taking a high-endurance aerial sensor "platform," such as a MQ-9 Reaper or IAI Eithan unmanned aircraft system, or a blimp or airship, and marrying it with a WAAS type sensor payload. This payload usually consists of canoe shaped pod that has high-resolution electro-optical sensors pointed in many directions in a fixed manner. Onboard computing and software can then stitch these staring cameras' "pictures" together, creating a continuous high resolution overall image of a large swath of land or sea below. Users can then instruct the WAAS system to send them a high-resolution live video feed of a certain area of that massive 'fused' picture. The WAAS system then data-links down the video of the geographical area requested by the user. Thus the user will have real time streaming video imagery of a portion of the entire area WAAS is persistently viewing at any given time. By down-linking just the areas of the WAAS picture that are requested at any given time, less data bandwidth is used and the end user requires a less capable modem and computer system to exploit the system's game-changing abilities. By each 'customer' taking just the portion of the WAAS system's entire picture that is relevant to their mission, multiple users can receive separate feeds from a single system at any given time. For instance, a single feed from a drone with a WAAS payload "orbiting" high above a town in Afghanistan could be used by CIA headquarters back in Virginia for one reason, while a platoon leader deeply entrenched in the fight miles below the orbiting WAAS equipped aircraft could simultaneously use its live video for an entirely different purpose. To be more detailed, the aforementioned CIA team back in the US could be watching a house for a high value target in one part of a town, while the platoon leader uses his WAAS down-link to watch for enemy heat signatures approaching his team's position in an entirely different part of that same town. To extrapolate this scenario further, that same lone UAV, aircraft or airship that is providing WAAS coverage over the town in question could also be supplying video to helicopter crews planning a medevac mission, bomb damage assessment video to a USAF intelligence team checking to see if an air strike was successful, and at the same time a resupply crew could be using WAAS to find the safest way through the town's hostile streets. Because WAAS sees everything at all times, bandwidth capacity is all that limits its use to anyone that may need it. In the field of aerial surveillance, the term revolutionary is an understatement when it comes to the WAAS concept. No longer will multiple UAVs or surveillance aircraft have to be launched to support many different missions in the same geographical area. That's a task that takes detailed scheduling, immense manpower, and large sums of money. Furthermore, current UAV launches never offer enough individual surveillance assets to go around. Even for those missions that do receive over-watch support, current sensor platforms' effectiveness is limited by the narrow field of view of their sensors, which provide lackluster overall situational awareness. With a single WAAS equipped aircraft, a whole town can be continuously surveyed. Virtually anyone who requests its support can have it just by having the proper hardware, training, and by simply telling it where they would like to look within its coverage area. WAAS could do the majority of the classical Predator's or Reaper's surveillance tasks but in a much cheaper, persistent, and user-friendly way. For activities like following vehicles, watching for suspicious patterns of life, or looking out for particular events and gatherings within a population center, the Predator's soda-straw view of the world, is no match for WAAS. You could say the same for a satellite's ability to only capture a moment in time. Additionally, WAAS could be programmed to trigger alerts if it sees things like large gatherings, roadblocks or detects infrared signatures of rockets being fired or of a homicide bombing. When paired with on-board artificial intelligence and advanced software algorithms, certain vehicles or locations could be "tagged" for surveillance. For instance, an operator could program the system to follow any vehicle that comes and goes from a location of interest, or to follow a particular vehicle indefinitely. Then programming can be put in place that would alert an operator when a certain amount of "tagged" vehicles are nearing the same location, say for a suspected terrorist meeting or arms smuggling deal. Also, a user could take a certain area and tell the WAAS software to alert them when there is any type of movement. Such intelligence could be used to rapidly find, fix, and capture or destroy high value targets in an incredibly rapid manner, thus greatly condensing the "kill chain," which is one of the DoD's and CIA's highest priorities. WAAS capability is only now becoming a true operational reality. As the concept develops, along with its increasingly capable supporting technologies such as in-the-field mobile computing terminals and modems, the end product and the user interface will continue to improve and evolve. Eventually, the WAAS interface may work in a similar manner to Google Earth, where the user can see a low resolution image of the entire coverage area, and then order WAAS's servers to "magnify" the user's area of interest simply by clicking on it and zooming in. Such an interface is not only intuitive, but it also saves transmission bandwidth and processing power as the user is only utilizing a small portion of the WAAS high resolution coverage area at any given time. Because such a system's imagery can be used for so many things by so many people, WAAS will make current ROVER-like terminals, once mainly the tools of forward air controllers, also known as Joint Terminal Air Controllers or JTACS, a common piece of kit from the platoon level on up, and eventually even individual soldiers may have the ability to view WAAS feeds. Having WAAS's real-time enhanced situational awareness and dynamic mapping available at the soldier level may be made possible through the miniaturization of ROVER type terminals and the installation of "app" software on multi-use hardened computer tablets. Not every soldier in the field would need to be outfitted with the equipment required to receive a streaming WAAS down-link. By creating a single Wi-Fi "hot spot" from the team's ROVER-like terminal via connecting it through a wireless router, the whole unit could take advantage of a streaming WAAS feed over their area of operations. This way, the deployed WAAS system would only have to create a single feed covering a limited geographical area, but that single feed could be used by anyone logged onto the team's mobile wireless network. This means an embedded JTAC could use WAAS to develop coordinates for a GPS guided bomb, while another member of the team monitors their surroundings for enemy patrols, while yet another member of the same team attempts to find their sister platoon operating close by. In other words, not only could a single WAAS platform be used by many different users working on many different missions, but a single WAAS feed could be redistributed and exploited by many different individuals in the same unit without taxing the WAAS platform's data transmission capabilities any more than a single user would. WAAS feeds will also be migrated to the desktop environment for widespread exploitation by those not directly in or around the immediate surveillance area. In fact, users won't have to be even on the same continent. Just like how your music can be stored and streamed from the cloud, operators, commanders, soldiers, intelligence officers, mission planners and others, many of which are thousands of miles away from one another, will eventually be able to view WAAS's output on demand, all without having to coordinate a proprietary sortie and data channel specific to their individual objectives. As computing and data transmission technology improves, the video data from an entire WAAS coverage area could be beamed up to a satellite or down to a ground entry point, pushed to a remote server, and then accessed by anyone around the world who has clearance to do so in near real-time. Eventually, WAAS equipped flying machines will even be able to store or transmit everything that they see for later dissemination, and the results may change not only how we fight abroad, but also how we fight crime here at home. If WAAS's data can be fully recorded and stored, a user won't have to know what exactly they are looking for, or even precisely where they need to search for it, before they start looking because WAAS's "total picture" will be able to be exploited after the fact. This is precisely where the WAAS concept turns from cutting edge surveillance to borderline dystopian science fiction in nature. The clip below is from the Nova documentary I worked on, in particular getting the producers to get access to WAAS technology. Three years ago, this capability was widely unknown and this was one of the first, and certainly the most detailed, public views into the program. I wrote the first version of the piece you are reading now about six months before work started on the documentary. In larger US cities, police rely primarily on helicopters and fixed wing aircraft to provide overhead surveillance for emergency response and other situations such as hunting for suspects on the run or responding to fires. Small drones, such as the Raven, have begun to be introduced as miniature officer-deployable stand-ins for traditional fixed or rotory winged surveillance assets. Yet these small unmanned systems exist due to their low cost and their quick deployment capability, not because their sensors are superior to those mounted on heavier manned flying law enforcement assets. Traditional law enforcement aircraft are expensive to operate and can only be tasked to one mission, in one area, at any given time. For large cities, there may be a need for maintaining more than one aircraft in the air during peak times of day due to the sheer volume of air support requests that come into dispatch. These aircraft need to be constantly refueled, maintained and their air crews kept fresh, which is not cheap or easy to say the least. Additionally, law enforcement aircraft can only really see, or transmit for that matter (if they possess this capability at all), images from their FLIR turrets, which like their military cousins, have a very narrow field of view, leaving the large situational picture to be conveyed via old-fashion air-to-ground radio communication. Since these airborne surveillance assets are usually on call, like the vast majority of police capabilities, they can only survey a crime scene after the crime or illegal event has already taken place, or at best, as it is in progress. In doing so, they are very expensive 'reactionary assets,' but what if they could see everywhere at all times, thus they could observe not only a crime's aftermath, but also as it was committed or even before it ever occurred? So what could Wide Area Aerial Surveillance mean for civilians, first responders and domestic law enforcement agencies in the not so distant future? Well let's make a hypothetical attempt to fully comprehend where this startling technology is actually going to take our society. Let's just say a WAAS system was deployed aboard a stationary blimp that is holding its position some 25,000 feet above the exact center of a medium-sized city in the US. Once again, this blimp (or a high endurance medium altitude unmanned aircraft) carries a WAAS payload, with dozens, or even hundreds of fixed multi-spectral imaging cameras that stare in every downward direction, each surveying a portion of the hemisphere below the aircraft. The WAAS system feeds each camera's video picture to an on-board central computer that uses software to seamlessly "stitch" their individual video feed together into a continuous quilt like mosaic that covers the entire city below. Attached to this computer system is a state of the art high-speed line of sight data-link communications system that can stream the entire WAAS data-steam to a ground entry point below. Its data is then stored on secured servers on the ground and distributed to various end-users on demand. Fire, police, city hall, FBI, FEMA, the National Guard, the US Coast Guard, Homeland Security, ICE and other folks with a specified need to have access to the WAAS system have secure connections over the internet to access the its server. In larger operations centers, like at police or fire headquarters, the WAAS feed can be viewed and manipulated using powerful exploitation centers, with large projection screens as well as individual touch screen interface terminals. For those with less of a dynamic and more limited requirement for WAAS data, such as a transportation office conducting a street traffic monitoring survey, the WAAS feed can be brought up on a desktop computer and its features can be limited or locked out depending on the user's project requirements. In other words, who gets what data, at what volume, and with what tools, as well as how each customer is able to interact with WAAS, will be totally scalable. If WAAS were working without a powerful ground-based server, the system's available transmitting bandwidth could also be triaged, with first responders at the top of the priority list, and non-essential entities at the bottom. This way during a time of crises, police and fire personnel will be able to access the system's full potential, while less critical users could be temporarily "dropped" until free bandwidth becomes available. For this hypothetical we are assuming that WAAS is able to send all of its content to a ground based server and storage center, so this is not an issue but may be for temporarily deployed systems, such as those used during natural disasters. So we have a city with WAAS floating high overhead, now let's say a fire breaks out in the north-east industrial district of the aforementioned hypothetical city, and at the same time a bank robbery takes place four miles away in the south-west business district of that same city. Once the 911 call is received and the alarm goes off at the fire station, the fire chief will have the address immediately pushed to his WAAS terminal, or even his computer tablet while on the go as the system is integrated into 911 dispatch. Here the Chief can immediately view how extensive the blaze is, what hazardous or endangered structures are nearby, and what assets are already on the scene. This real-time streaming video allows him to immediately tailor his response to the visual information he has at hand, sending more assets if the fire appears to be of great danger to the population and infrastructure around it, or holding back assets in reserve if it appears to be less catastrophic in nature. He can also check for schools and other sensitive infrastructure nearby and immediately order their evacuation if it is warranted. Meanwhile, as responders are just arriving at the scene of the fire, a 911 call comes in from the aforementioned bank, located on the opposite side of town from the fire, that has just been robbed by a group of masked men who have fled the scene in an unknown vehicle. Immediately the police can access the WAAS feed of the bank to see if there is a firefight outside or if other dangers exist. They can instantly relay this information to the police units that are inbound to the scene by "exporting" the WAAS feed directly to their police cruisers. For the first time in history, real-time and highly precise information of a crime scene environment can be conveyed to those moving into harms way without relying on a vague information from distressed witness. With WAAS high overhead there is no waiting for a helicopter to arrive on scene to begin relaying an overhead situational picture via radio communications or video data-link, that is if a helicopter is available at all. WAAS imagery is conveyed in real-time and is instantly available for exploitation and distribution from the moment the 911 call is placed. Once commanders back at police headquarters have a good idea that their officers will not be in direct danger when they pull up to the scene, they can immediately send a request to the WAAS server to "rewind" the imagery of the area around the bank from before the crime took place. By viewing this "past-tense" archived WAAS footage, police commanders can almost immediately see the suspects arrive at the scene. In doing so, the police have gone from not even having a description of the getaway car or even an exact number on how many perpetrators were involved in the robbery, to knowing exactly how many suspects were involved and exactly what color, make and model of car they drove. Immediately after watching this archival WAAS video, headquarters sends out a screen capture and a description of the vehicle involved in the crime to officers' cruisers and smart phones, as well as details including how many suspects should be in the vehicle. Without WAAS this time-sensitive critical information could have taken hours to obtain through the arduous process of interviewing those on the scene and collecting surveillance video tapes from on-site and nearby cameras, if such footage is even available at all. By using WAAS, it only took a matter of moments for police to not only obtain this information, but to act on it as well. Now that the police know the exact car that was involved in the crime, they can tell the WAAS server to "tag" that vehicle and follow it as it left the scene retroactively, once again using archived footage, tracking it all the way up to where it is at present time. Once this is accomplished, WAAS should have the current location of the car brought up on the main screen. If WAAS was able to "track" the tagged vehicle accurately, it would allow police to apprehend the suspects via relaying the car's exact coordinates as the WAAS software continues to track it. Even if the car has driven outside WAAS coverage by this time, the system can still help solve the crime in a fraction of the time once needed, by looking farther back in its all-seeing memory banks. WAAS tied to a large data storage bank is an omnipotent evidence collector, providing an indisputable historical record of what took place anywhere outdoors, at any given time in a city below its omni-directional unblinking stare. Once all the aforementioned critical tasks have been performed by police in an attempt to locate the suspects at large, the police commander can then task the department's detectives to use WAAS to backtrack the exact path that the car took from its place of origin before the robbery took place. WAAS could look potentially even much farther back in time to find out exactly where the car "lives" and even where it goes on a day-to-day basis. Within hours, this information would be used to positively identify the suspects involved in the crime, while also identifying who they are regularly in physical contact with, all without even having to inspect the crime scene, interview witnesses, or ask the public for tips, and presumably without even obtaining a warrant. Eventually, WAAS could not only allow users to see what is happening in real-time, or in the very recent past, but it could also be able to see what was happening hours, days, or even weeks before the event in question ever took place, thus making everything from verifying alibis to solving entire crimes significantly easier, and wildly less time consuming than ever before. With WAAS overhead, every crime scene will be under surveillance before a crime is even committed, and every suspect can be potentially tracked before they are even suspects. This is the potential of using Wide Area Airborne Surveillance's all-seeing capability in a regressive manner. WAAS type technology, when paired with large amounts of data storage, is a time machine of sorts, and will change the world of criminology and forensics forever. Just think how such a technology could have changed the manhunt for the Boston Bombers. With WAAS, law enforcement could have possibly tracked the men after planting the bomb, and they could have looked at all movements from their places of residence, both in real time and back hours, days or even months before the bombs were planted. Once the phone call came in to 911 in regards to spotting the two suspects at a gas station, police could have pulled the WAAS imagery up from just after the two were present, then tagged the car they were in, and let the system track the vehicle to the point of real time. Even after the violent confrontation between police and the two brothers, once the younger brother ran from the scene, WAAS could have potentially tracked his infrared signature, which would never allowed him to hide for hours while Boston was at a standstill. The WAAS concept is simply mind blowing in its ability to greatly condense the assets and time required for a successful "manhunt." Although WAAS's potential crimefighting capabilities are Orwellian in nature, the same technology could also be used to a great degree during natural disasters. FEMA could launch a WAAS equipped airship or drone within hours of a catastrophe occurring Its data could take in the general destructive nature of the event as a whole via the use of comparative mapping. It could then begin to examine neighborhoods at a rapid rate to assess the damage and to identify those in need of rescue. Such a capability would have been invaluable during the aftermath of Katrina, when people were literally on their roofs awaiting for an air asset to see them an affect a rescue. During earthquakes, not only will WAAS be able to help analyze destruction, but it will also be able to see where survivors are congregating, as well as use thermal imaging to see where fires are burning. A WAAS system equipped with a sensitive infrared array could help firefighters contain and extinguish forest fires burning over large areas. WAAS could also help track firefighters and their vehicles in real time if they were equipped with transponders or even infrared strobes. Similarly, the Coast Guard could use a WAAS like system to look for survivors at sea, allowing the system's artificial intelligence to "flag" objects that could be of interest for operators to review, then "tagging" them for tracking if the contact needs to be investigated further by a low-flying helicopter or a ship. The ability to search persistently in an optical fashion over much larger areas than ever before via WAAS would require fewer aircraft to conduct search and rescue operations. At the same time, they'd be executing a search grid much faster. Grid pattern searches of a couple of miles wide could now be increased to tens of miles wide, allowing WAAS to do the wide area searching, while more tactical assets can be tasked with investigating anything interesting that the system detects. Ideally, a MQ-9 Reaper could actually prosecute both tasks at a single time, using WAAS to look at the big picture while relying on the drone's more traditional telescope-like electro-optical sensor turret (such as the Raytheon MTS-B) to investigate anything WAAS's computer software "flags" for further examination. Similarly, the US border is an area where WAAS could be of great value. It could offer an unprecedented level of situational awareness over large areas along the border. Instead of using helicopters, fixed wing aircraft and drones to look for a proverbial needle in one tiny portion of a haystack at a time, border agents can now look at any large chunk of the haystack at anytime, allowing the systems software to identify potential "needles" with greatly enhanced efficiency. Then, once a contact of interest is discovered, high-demand border patrol manpower and aviation assets can swoop in to investigate. In other words, WAAS may be able to do much of the "patrolling" on its own, with the direct action and on-site investigations handled by those who were once burdened with the often fruitless and inefficient patrolling and surveying. Finally, WAAS will be a must have for temporary large events and gatherings, such as the Super Bowl, Marathons, Political Party Conventions, etc. The ability to have the ultimate situational awareness tool at counter-terrorism and law enforcement's fingertips would be a huge plus not just for preventing an attack but also for enacting a coordinated response to one. Even speeding and reckless driving tickets may one day be given using WAAS as the primary sensor for gauging such infractions. Wide Area Aerial Surveillance is truly the irresistible red apple hanging in the modern garden of surveillance technology. What we are talking about here is persistent faux-satellite style real-time video over comparatively massive areas of earth's surface. It is the holy grail of overhead surveillance. No matter how much time, effort and money it takes, and no matter the legal or moral hurdles, WAAS will almost certainly become a widespread operational fixture not only over the battlefields of tomorrow, but also over a city near you. In fact, domestic WAAS systems could largely eliminate legal battles such as the "GPS trackers on cars" case of recent memory, as there would be almost no need for invasive modifications to a citizen's vehicle in order to keep tabs on it if there is a persistent WAAS presence overhead. In addition, the speed of which information can be gathered and extrapolated for many crimes, all without a warrant, is game changing. Seeing as the Supreme Court has been very flexible with police using aerial surveillance as long as the imagery is visible to the eye and does not 'pry' into private structures, it is doubtful that WAAS will be curtailed via lawsuits, at least in the near-term. As a detective or case handler, why would you use scarce manpower on tailing a suspect when you could simply tag the car in the WAAS interface and watch the results at your leisure? Since it is costs almost nothing to tag a car in the WAAS system for tracking, it will be much easier to survey many vehicles and their patterns of movement. That could potentially lead to widespread use for currently relatively unimportant suspects, as well as widespread abuse. Altogether, WAAS gives a huge amount of intelligence cheaply, to many different end users, both in a real-time and eventually in a regressive archival manner. There can be no doubt that its technology will save many American lives here at home and will greatly assist in taking many of our enemies' lives overseas in the wars of tomorrow. Additionally, as a tool of justice, this technology can make solving complex crimes incredibly easy and comparatively cost efficient when contrasted with methods of forensic science and criminal investigation in use today. Some would argue that WAAS has an even greater potential for abuse than the unique systems used controversially by the NSA today, especially because of how many people could have access to its data in the not-so-distant future. Fielding WAAS over over our towns and cities will in some citizen's eyes only further our evolution towards an unconstitutional police state. Regardless of these objections, WAAS is coming and it is going to see everything you do outdoors and everywhere you go. In fact, it is already being fielded on a limited scale in Ohio, and other cities have tested the system with astonishing results and are looking at fielding WAAS systems and getting around the FAA's drone ban by contracting manned aircraft to lug surveillance payload to altitude. Using a manned surrogate takes some persistence out of the concept, but works well for monitoring large planned events and widespread emergencies for shorter periods of time. From vanquishing America's enemies in strange foreign lands, to surveying our every move here at home, America's drone and surveillance technologies are coming home from war just like our troops, and it is highly likely that they will be finding jobs high above our cities and towns in the very near future. Adapted from a piece previously featured in 2012 over at Aviationintel.com, photo credits defense industry, public domain, OH-6 crew picture- Magnus Manske/Wikicommons.